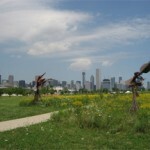 The Chicago Park District announced that the ecological restoration of Northerly Island Park will begin in the fall as the park becomes a new urban camping hub for families, children and at-risk youth. The total budget for the restoration project is $4.3 million, with $2.8 million covered by a federal Great Lakes Fisheries Ecosystem Restoration (GLFER) grant. The Park District is providing $1.5 million out of the reserve from revenues generated by the concert venue at Northerly Island. The concert revenues will also help fund the cost of the camping programs, including spots for at-risk youth. The new programs will add 900 family camping opportunities at Northerly Island annually; 600 of these slots are for family campers and 300 are for young people ages 12-to-15 in the Wilderness Camping program. Some of these opportunities are timed to coincide with breaks in the Chicago Public Schools year-round school schedule. The new programs will start to be offered in 2013 and will continue to increase to full capacity after the park is completed in 2014. Construction is expected to begin in November 2012 and be completed in spring of 2014 which also includes a five-year plant maintenance program with portions of the park, such as the trail, opening in the fall of 2012.